I have taken individually over the past 11 years Rebif, Copaxone, Avonex, Betaseron, Novantrone, and Tysabri. 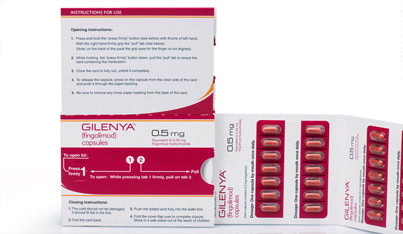 I will soon start the oral MS pill Gilenya. This is part 1 of my MS pill journey. Thanks for posting this video. I can not wait to get off all the injectable MS drugs. I’ll be interested to hear how you do on the Gilenya. Merry Christmas!! Good luck Nicole! I have been using Gilenya for 6 months and loving it! Definitely better than shots! I have been on Gilenya since last March. I have PPMS, and while Gilenya is not specifically indicated for PPMS, my neurologist is hoping it will have “neuro-protective” properties and slow progression. So far, so good. I am “stable” even though my doctor also says the damage that has already occurred will not be undone by Gilenya or probably anything else. As far as the drug itself, it has lowered my heartrate to the 60s pretty much all the time, but that’s no big deal. My complexion seems to be a bit worse and things take a little longer to heal, but no other side effects at all. None. So much better than injections. Wow–no comparison there! Anyway, best of luck to you with this. I’ll keep you posted on my progress. Good luck! I am also starting Gilenya soon. Lynn, We’ve got to keep each other informed! I thought all it MIGHT do is offer a slight chance less relapses? Jon, You’re right. A girl has to dream, though! Hey there we get to see you again! Your vids are super. Keep keeping on as always and I hope this round of pills helps. Positive thoughts – but of course always! Looking to see you improve. Have to check with my DR on this drug. I am praying for you. I hope it works. I have never heard of this medication and like you I have done medication after medication; I am now participating in a study. I take place not to help myself but with the hope that this might be a step for a cure for those younger than myself. God Bless and take care. good luck with the oral pill. I am a similar case taken steroids, copaxone , chemo etc now am on Tysabri for past 7 yrs. beside the aggrevated symptoms no new leision. even the old ones are non active till July. though in present am having many symptoms activated still ” am hanging on”. i did try to talk my neuro at Miller school of medicine, FL but he thinks if no lesion than am doin good. rest goes on with relapsing remittan MS. once again good luck and do keep updated with this new medicine. may be in my case also can be shifted to the oral tablet. I can see your excited. Best of luck. Happy Thanksgiving! supporter no 2 from across the pond (england) is also rooting for you, i will keep everything crossed and pray you notice a change for the better. Thanks for posting this video. I always enjoy you because you come across as so upbeat. I’ve gone off all the injectable meds because they just didn’t help me at all. I’ll be interested to hear how you do on the Gilenya. Happy Thanksgiving! Wishing you the best of luck! I sure hope this drug slows down the MonSter and you see a lot of improvement. I do hope you get better. Happy Thanksgiving. Good luck with the new meds! Please gd they will help you and you will see a noticeable difference. You got one supporter rootin fer ya across the pond (England). Best wishes.